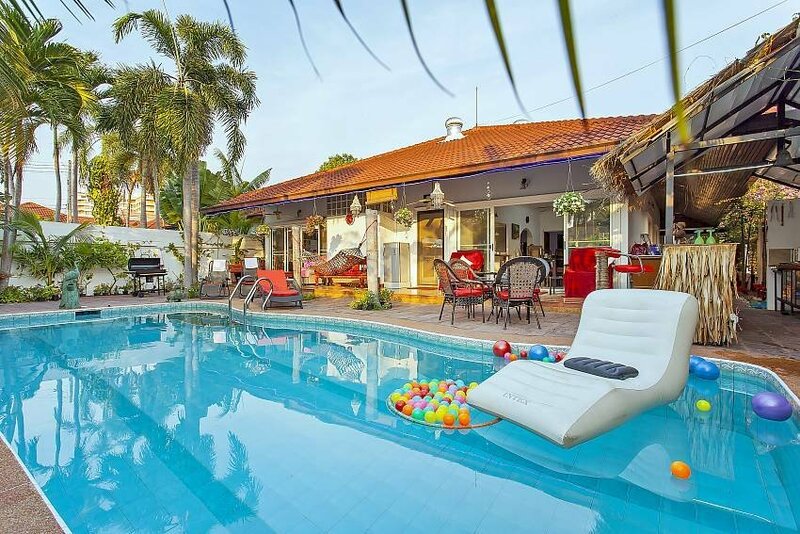 Here is a rental that provides an exciting base for your Pattaya holiday, where you can enjoy the proximity to a range of attractions as well as fun in-house facilities. The villa is set in a residential village and it spreads over a single floor. It offers many nooks and crannies in which you can relax and catch up with one another, especially on the pool patio that acts as an outdoor living space. If you get hot, the actual living room which features a pool table is only steps away. There are 4 bedrooms, 3 bathrooms, and a guest toilet at the villa, as well as a fully equipped modern kitchen that is connected to the dining and living area. All rooms offer a choice between an air-con and a ceiling fan. The master, second and third bedrooms each feature a king size bed, and the fourth bedroom is fitted with two single beds. While the master and the second bedroom each have an en suite bathroom (there is a bathtub in the master bathroom), the third and the fourth bedroom share one bathroom with a shower. All rooms are fully furnished and feature a wardrobe and a vanity table; two of the bedrooms also have a TV. If you love reading, the villa’s book selection will impress you, and the rental also comes with free internet and daily maid service. The villa is within walking distance to a selection of restaurants and a 7/11, and many of Pattaya’s attractions are less than a 10 minutes’ drive away. Pattaya weekend night market is about 1 km away.